Ronda - thanoscardgamess jimdo page! This is the most popular card game in Marocco. It is a fishing card game. It is played with 2 teams of 2 players. The play goes around the table counter clockwise. The player to the right of the dealer starts by putting a card from his/her hand on the table. The next player does the same. Play continues around the table until the cards are exhausted. If a player has a card in his/her hand that matches a card on the table, he/she may play that card and pick up both his/her card and the one that matches. If there is a card on the table with a number 1 higher than the card played, he/she can pick up that card, too. He/she can continue picking up cards from the table with succeedingly higher numbers until the run is broken. 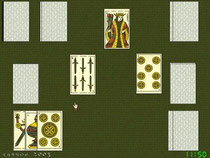 If, during play, a player matches a card just played by the player to his/her left, the player earns 1 point.